I have NO idea where the weekend went!! Bruce and I had "date night" on Friday night. While we were on our honeymoon, we decided to institute a once a week date night. We didn't put any restrictions on where, when or how, but we did say that once a week (and once school starts back it needs to be for at least a couple of hours - now it's sort of one night a week) we will do something for the two of us. We decided Friday would be good last week because it was the end of our first week back at work and we knew would need a night out!! We went to Chili's and then came home to watch he's just not that into you. It was phenomenal!! I wish it had been out when I first started college - I think I may have made some different decisions - though I hate to think of experiences as mistakes (more on that later). We really wanted to sleep in on Saturday morning, but I needed to go the DMV to get my name changed on my license. Not only was it a name change, but I was transfering my Connecticut license to Georgia. I didn't anticipate it being a process. Ohhhh, how naive I can be. First of all, I wasn't paying attention when I was mapping the closest location. Because I thought there was a DMV location at North Dekalb Mall. Turns out (after going there and wandering around the mall aimlessly for 20 minutes) the location is at South Dekalb Mall. But we didn't go straight there. Bruce took us to the location he knew from when we registered the Jeep in Georgia last year - but when we got there we realized that it was a tag office, not a DDS (where you can get a license). So THEN we went to the location at South Dekalb Mall. We waited in line for 20-25 minutes, got to the front of the line and the woman told me that I would need my birth certificate. Now - my birth certificate is safely tucked away in my parent's safe deposit box in Connecticut (I know, great place for it, right?). I was floored by this discovery, because I was SO CAREFUL to read the instructions online. I just couldn't believe that I had missed the part that told me I HAD to have my birth certificate. So the woman told me I was out of luck, and sent me on my way with the paper that said what I needed. So we're walking towards the car, reading the sheet where I read that I need "one item from column A." Which meant I needed either an original and/or certified copy of my birth certificate or my passport. I had my passport with me. (I KNEW I had read somewhere that I could use my passport!!) So - back in line for 25 minutes where Bruce and I ask the woman if my passport would suffice, because it seems like it should. She (condescendingly, if you ask me) asked me if I had my passport, scoffed at the fact that I did and then gave me a number. Let me ask you this - why are people so rude when I walk in prepared and with a smile on my face?! Needless to say ... three locations, two tries at the line and about 3 1/2 hours later - Sarah Weaver is a licensed Georgia driver!! It's amazing, though, how much time is wasted at the DMV. We really didn't get much done after we got home. 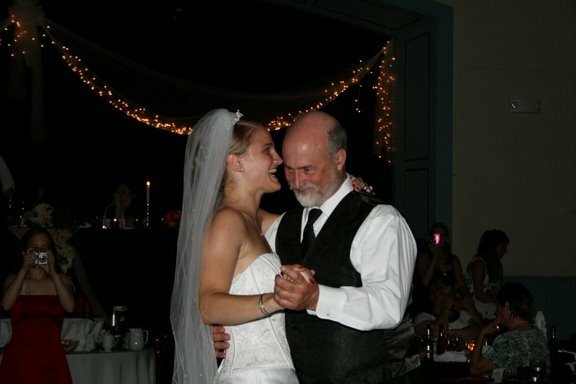 I was having a hard time finding a father/daughter dance. Most of the really good ones are also REALLY country - and my father isn't a fan (to put it nicely) of most country music. So Bruce and I decided to try to pick songs that spoke to the relationship that we have with my father and his mother. I thought back to my freshmen year of college - my parents gave me a journal before I left and they both wrote notes in it. My father wrote - simply - "no experience is ever a waste of time" and has repeatedly told me that in the 6 years since I started at Ursinus. It's simple, but has really resonated in me. I know my actions and decisions haven't always reflected the person I want to become - but they are all part of the road that have gotten me here - and will get me where I want to be. ... a lot of laughter ensued. Followed by my dad saying, "Well, no experience is ever a waste of time!!" So - even though this weekend was a little frustrating, NO experience is ever a waste of time. It's about the journey - it's about the climb!! Has anyone else been listening to Michael Jackson nonstop today? Everyone in my office is. It's kind of fun to walk down the hall and hear the different songs playing. We're trying not to be sad - just grateful he shared his music with the world. Kellys Korner Blog is hosting "Show Us Where You Live Friday" again today!! Today is Master Bedrooms. I LOVE seeing what people have done with their master bedrooms. They really are - well SHOULD BE - a sanctuary for the person or persons living in the house. So check it out!! I'm having so much fun looking in from the outside on these tours. Bruce and I have been "apartment living" for almost two years now and we are READY for a house. Let me rephrase that - financially (and where I am in school) we aren't ready. But in terms of being ready to get a fixer-uper and mold our house into our family's home we are definitely ready!! I'm ready for paint colors and kitchen remodels, a basement turned media room and television-less living room, a garage for Bruce and a real office (with walls!!) for me. I think fixing up a house, or taking something old and in need of TLC and bringing it back to life, speaks to the second creation story accounted for in Genesis. God used dirt to mold and then BREATHED LIFE into mankind. How cool is that? I just think using the same care to turn a house into a home is a great way to live out God's call in life. I hope everyone's having a great start to their weekend!! I remember it like it was yesterday. I was in my parents' family room in their old house on Charterhouse Road in New Milford. The family room in that house was huge. The television and seating area was on one side - the side with the sliding door out to the back deck - and my mom's desk was on the other side - the side by a big picture window looking out to the driveway. We had some family friends over to watch the Super Bowl. Not caring much about football, I was looking out the picture window when I heard one of our friends gasp excitedly at the TV. Even on the other side of the room, I quickly saw why he was so excited. 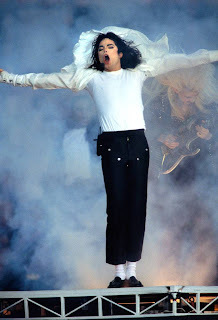 Michael Jackson had just appeared through fire on the 50 yard line. It was Super Bowl '93. Jackson thrilled millions that night with brilliant dance moves and revolutionary (for its time) pyrotechnics before bringing 30,000 children onto the field for a rendition of Heal the World that - without a doubt - left many houses in America without a dry eye. From there on out my sister and I were fixated by Michael Jackson's music. He wasn't just a musician, he was a performer. And he wasn't just a performer, he was a musician. It's rare to find both. Michael Jackson had it all. He was the King of Pop. I know Michael Jackson lived amidst much controversy, particularly towards the end of his life. But that doesn't erase the legacy he left on music, the millions of dollars he donated to charity and the revolutionary stand he took on AIDS in America when Ryan White was battling a misunderstood disease and was considered a social stigma. For that I will always be eternally grateful. Rest in Peace, Michael Jackson. I pray that you can finally take refuge from your troubles, fears and anxieties. Did anyone else see this on the Today Show this morning? I thought it was one of the sweetest things I've seen done in a long time for someone on the plaza. Unexpected, which made it that much more special, I'm sure!! I hope they went to lunch!! ... that's right - we're seeing nothing below 90 with LOTS of humidity!! After spending the winter finding creative ways to bundle up on the scooter because it was so cold when I got up to speed, I now find myself baking in the sun at red lights. We've tried to keep our thermostat set around 75 and even then the AC runs nonstop to keep it even that cool. I need to remind myself that - even in the United States - air conditioning is still a luxury. Not a year goes by where there isn't a heat-related death that could have been prevented with access to air conditioning or better hydration. For all of us down south - let's remember to count our air conditioning as a BLESSING (even when we get the bill from Georgia Power)!! SO - Back to the wedding!! 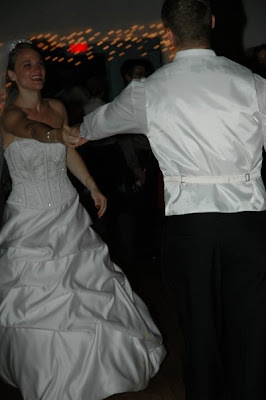 I never really liked the idea of the traditional "bride and groom dance to a super slow song, rocking back and forth while everyone stares at them" first dance. I just didn't think I could tune everyone out watching and have a really intimate moment and enjoy the dance. There are tons of videos on youtube of couples who have choreographed their first dance, but - let's face it - Bruce & I aren't exactly Fred & Ginger. Back in January, Bruce and I were watching coverage of the Inaugural Balls where President & Mrs. Obama danced to At Last, sung live by Beyonce. Bruce looked at me and said: "Hey, if it's good enough for the president, I think it's good enough for us!!" We knew from the beginning that we wanted to use the original Etta James version. Classic, yet not necessarily overdone. Slow and first dance worthy, yet not slow and sappy. Plus - crowd favorite. 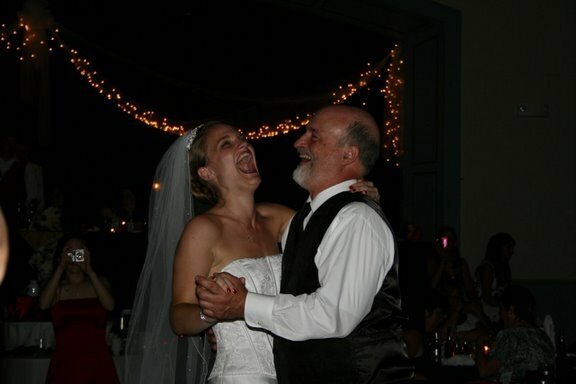 Here we are dancing - and having a conversation about why Bruce should or should not spin me. 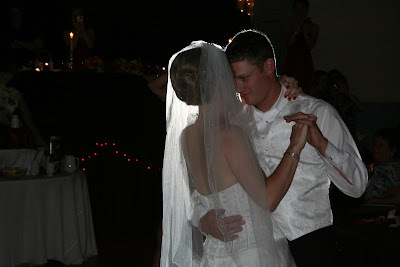 Yes - I know the first dance is supposed to be about love. But I wanted Bruce to spin me and he didn't think he could - so this conversation took up part of the dance. But we were having fun - that's what it's all about, right? In the end - you and your new spouse should do what's comfortable for you. This worked for us and was pretty much perfect!! 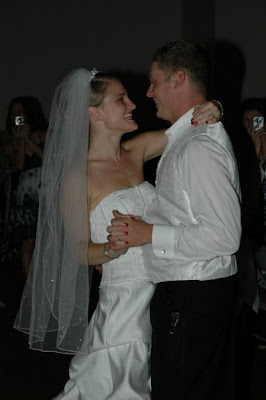 You'll never get the first dance back, so choose something that will let you savor every minute and walk away brimming with happiness. How many of you all have ever visited The Hunger Site? Not only is food donated by the sponsors when ANYONE clicks on the links in the site (feed a child in your pajamas? fabulous!! ), but they also have an AMAZING store with unique and beautiful jewelry (among other things). But still. Fun to play. I put the link to the Hunger Site store on the left sidebar of my blog. If you haven't checked it out - you should!! ... while the ceremony is the most important part of the wedding day, the reception usually is what causes the most stress, headaches, anxiety, etc. etc. etc. 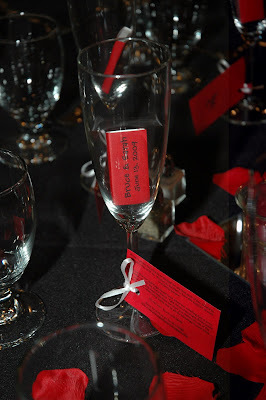 Here's a fun post about some of the details of our beautiful reception. Bruce really wanted his friends and family to be able to see the part of Connecticut that I grew up in and love and that he quickly fell in love with when we first started dating. I agreed, but knew that it would be a challenge. The northwest "hills" of Connecticut are known for small towns and local businesses - NOT hotels and banquet halls that can accommodate 230 people for a wedding. Needless to say - we had to be creative. We had originally planned to rent big tents and have the reception at my parents house, but started to think about the costs of renting two large tents for guests & dancing, one smaller tent for catering, a local industrial kitchen for the caterers, a dance floor, restrooms, and finding ways to transport from the church (because there isn't enough parking at my parent's house) we decided to change venues. We ended up renting out the Community House, a town-owned building that sits on the church's property adjacent to the church building. The building actually used to be owned by the church, but at one point I believe (don't quote me on this) the church donated the building to the town. It is very multi-purposeful. Growing up, I remember using it for the silent auction at our annual Harvest Fair, and seeing musicals & plays put on by the Kent Players. 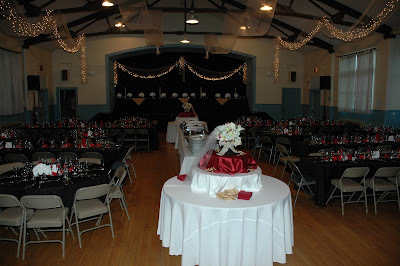 As we were setting up for the reception, different people told me what they remember of it - how it used to be home to the local police department, used for fire department fundraisers, girl scout meetings, yoga classes and more. The advantage to having the reception at the community house was that guests could literally walk across the lawn from the church to the reception, and they could get to their cars at any time. The advantage to having the reception at the community house was that all of our vendors (caterers, cake bakers, liquor store owner) know the building well and there is a fully-sized industrial kitchen for the caterers downstairs. 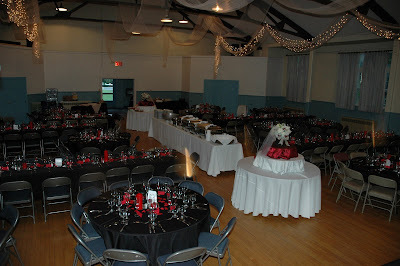 The advantage to having the reception at the community house was that the building already had tables and chairs and we wouldn't need to rent any of them with our linens. The biggest disadvantage to having the reception at the community house was the fact that we weren't in a banquet hall or hotel that does weddings week after week - we had to work out all the details, find individual vendors, rent linens & place settings, set up, decorate and remember guest amenities that normally the bride & groom and their families don't have to think about. We were EXTREMELY lucky, though. 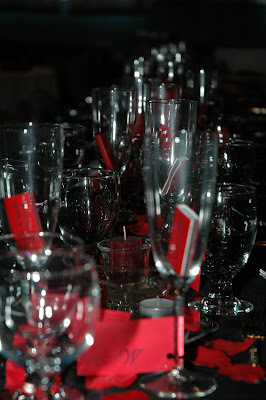 Our vendors thought of EVERYTHING and they worked well together to pull everything together. They were all local, which was what we wanted and they helped us navigate the not-so-local things we needed to get (linens, place settings, etc.). We were also really lucky that we had a lot of really enthusiastic church members that were willing to help us with all of the set-up. This is the reception all set up and ready to go the night of the rehearsal!! Because it's small town and my mom's the minister in town, we were able to get in all day the day before the wedding without a problem so we weren't doing any setting up the actual day of the wedding. We took these pictures with the overhead lights on, so pictures just the twinkly lights and the candles lit on the table and that's how it looked the night of the wedding. We set up the tables simply, but (hopefully) elegantly. 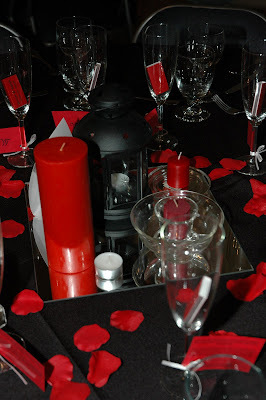 Black tablecloths, red rose pedals and mirrors with candles for the centerpieces. It really looked beautiful with all of the glass glistening. We didn't have any specific pattern to the centerpieces. We put the mirrors down and started with the big candles. 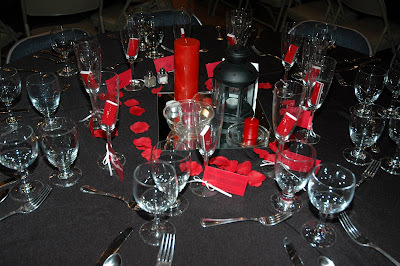 The caterers and their staff took on the task of lighting hundreds of candles that night and replacing them to keep them lit throughout the night!! I had asked my friend Courtney if she would be able to get us a cake knife & server set to cut the cake with and she OUTDID HERSELF. 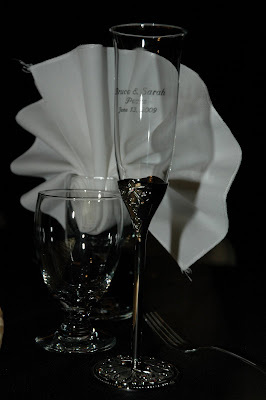 Not only did she get a beautiful set (which I couldn't find a picture of but I'll keep looking), but she also got these matching champagne flutes and got everything engraved!! They turned out amazing!! They put our names on them, as well our wedding date and the word "peace" to match our wedding bands. ... it gave them something to hold all of their candy in!! 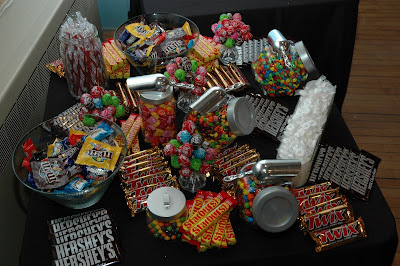 This was one of my FAVORITE PARTS of the reception - the candy buffet!! I saw the idea on The Knot and knew I HAD to have one at our wedding. It was SO easy. Bruce and I went and got jars at IKEA (if you, your parents or your friends have jars you can just use them - they don't need to match, we got all different kinds) and then Bethany and I went to Costco and got about $100-$150 worth of candy. From then on out it's just a matter of being creative!! The kids loved it, the adults loved it, Bruce & I loved it and it was SO simple. I hope you enjoyed my reception!! 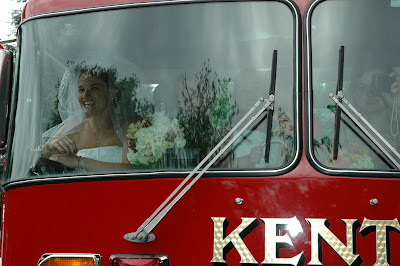 Today's wedding post is about the aftermath ... both at my parent's house and in Atlanta. First - my parent's house. There are two things that I find absolutely hysterical about this picture. #1. It's two days after the wedding and I'm still wearing my tiara (there is also a very good chance I wore it to breakfast at The Villager that morning). #2. 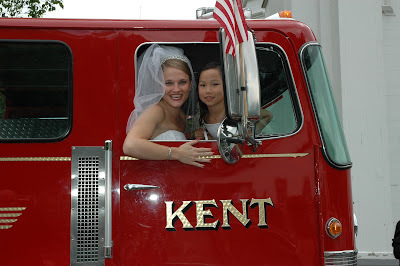 The beautiful fire truck that I blogged about in the previous post that gave me the grandest entrance to the church I could ever imagine left a two foot rut in my parents front yard. Whoops? Second - Atlanta. For all you brides out there - hairdressers tell you one thing to do in the months leading up to your wedding: Grow, grow grow!! So I did. 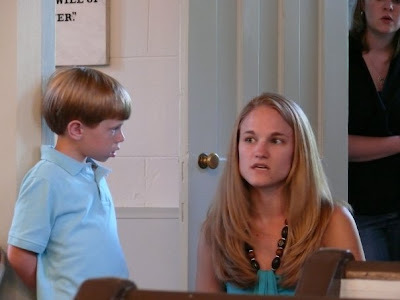 This is me talking to the ring bearer at the rehearsal. My hair was LONG!! One of the first things I did yesterday was call my fabulous hairdresser, Patrick. I was in the chair at 9:45 this morning. And I told him one thing: Cut, cut, cut!! In the grand scheme of things, it's not very short, but it's a big change for my hair!! It feels GREAT!! SO lightweight and manageable, which is amazing because it's been in the high 90s with lots of humidity in Atlanta since we got back!! I love it!! Thanks Patrick!! After a wonderful honeymoon at the beach, a LONG drive from Delaware and a loud trip to pick up Lilly at Kristi & Angie's, we are finally home and settling in as newlyweds!! It feels great. I'm still processing a lot of what happened so I think I'm going to try to blog a little bit each day with different stories and pictures. Warning - they probably won't be in any kind of order :) ... Today I'll start with how we arrived at that church for the wedding. 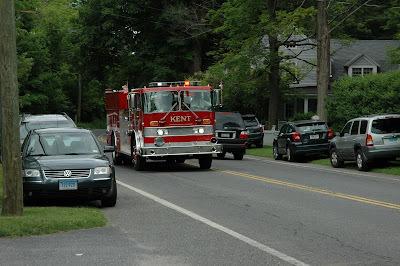 For the past 15+ years, my mom has been the pastor of the First Congregational Church of Kent in Kent, CT. Kent is classic small town CT - population 3,000, locally owned businesses, spotty cell phone service, constantly active gossip lines and a large volunteer fire department. 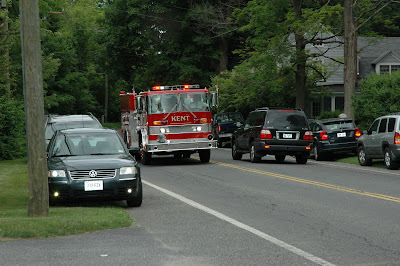 A lot of the people in my church are members of the fire department - EMTs, fire fighters, auxiliary, etc. - and my family has tried to be as active in supporting them as possible. A couple of months ago, I said something to John Worthington, a friend of our family, fire department members, deacon at the church and father of two beautiful girls I used to babysit for (who are now grown up!! 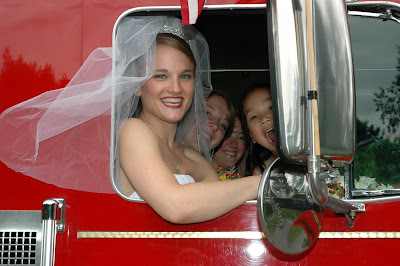 ), about how much fun it would be for me and my girls to show up at the church in a fire truck. And John made it happen. John brought the truck to my parents house around 2:15 (the wedding started at 3) so we could take pictures before we left. We were CRAMMED in!! From left to right - me, Steph, Kari, Kristin & John. Gabriella was on mine & Steph's lap, Jess & Barbara were buckled in to the seats behind the cab and Bethany sat on Barbara's lap. We didn't care. We were having a GREAT time!! My parent's live about two miles from the church. John drove really slowly and we waved to everyone we drove past. As we came over this hill, I gasped. I had never seen so many cars parked in and around the church. I was so touched that so many had come from near and far to share with Bruce and me. It was an incredible feeling. I think at this point we were cheering a little bit. There's a SLIGHT CHANCE that at this point the siren may have gone off. Now - the siren is not supposed to go off unless it's an emergency, so if anyone heard the siren we had nothing to do with it. Though - some would say it was an emergency. I had to get to the church on time!! When we pulled up to the church I couldn't help but smile. People were waiting for us to show up and were in awe of how we made our grand entrance. Needless to say - ten (or so) minutes of pictures and the ceremony didn't start on time. This is me and my beautiful flower girl, my cousin Gabriella Miko, at the church waiting to be helped out of the truck. 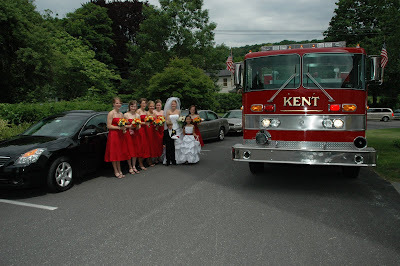 The bridal party (including ring bearer Andrew Fields) with the fire truck outside of the church. 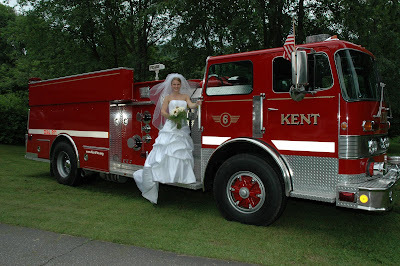 Thank you to John Worthington and the Kent Volunteer Fire Department for making this happen!! Pictures, stories & anecdotes to follow. But for now - I'm beyond elated. Deer - what my parent's dogs chased while I was out walking them today (do they realize that the deer is five times the size of them?!). Bear - what has been visiting my parent's neighbors house the past couple of nights. Dog Bite - what I got when I came between one of my parent's dogs and the dogs across the street. Needless to say ... I'm not in Atlanta anymore. Just another day, just a couple more things checked off of my list. My parent's phone rang ALL DAY. My family is getting ready to make the trip to CT so a lot of them are just checking in before they finalize their plans. People also want to know what they can do to help, which I'm simultaneously touched and overwhelmed by. It's amazing to me just how many people are reaching out to me right now. God has blessed me with so many people in my life and words CANNOT describe my gratitude. At one point there was a lull and I was home alone and I managed to finish my scrapbooks, wrap presents, pack up the candles so they're ready to be brought to the community house, put together a first draft of the seating charts and added some more music to the playlists. The caterer also dropped by to pick up her deposit so I talked to her for about an hour to talk about timelines, schedules for set up, etc. After all of this, I did what I absolutely needed to do - I went downstairs to run on the treadmill!! I think treadmills were invented after the wedding industry started to become what it is today. Partly cloudy. Lows in the mid-50's. Highs in the low 70's. Favors and Tiaras and Make Up, Oh My!! It's been a crazy couple of days, but one by one I'm getting things crossed off my list!! On Sunday I went over to Cindy Tyler's house - I went to school with her kids and she still does costumes, props, hair & make-up for my dad's shows - to do a trial run with my hair. She had a friend of hers come over and we played around with some different things and then found a style that we all loved. It was so much fun!! While we were doing that we also played with makeup and I settled on what I wanted for that too. It was fun to get all dolled up for the afternoon!! Seriously. I think that grownups should get to play dress up every now and then, too. I stopped by the high school on my way back to my parents house to raid my father's costume closet. I got mirrors, music stands (to prop mirrors up on), a steamer and more. We're getting ready at my parent's house and I think I have everything we could need. When I got home Bethany and I got ready to assemble 250 wedding favors!! It seemed more daunting than it ended up being and we got through almost all of them while we watched the Tony awards (did anyone else see that opening number? WOW!!). This morning after everyone had left for work, I poured myself some coffee, turned on soapnet and did some scrapbooking while the dogs slept. It was actually quite peaceful!! My mom came home around 2 and we went S-H-O-P-P-I-N-G. We actually didn't need that much. I needed some ribbon, a pillow for the ring bearer and makeup. My mom wanted to look at dresses since she decided she didn't like the dress she had picked out a couple of months ago. Well ... we got that and then some. But it was a fun day!! At 5 we picked up our friend Courtney from work and went and had dinner and then to the mall and David's Bridal to get the things we needed. It was fun to get out of the house and get some things checked off the list while having fun. So far I've been blessed and fortunate to have a balanced combination of time alone and time with friends and family. I got home tonight and finished assembling the favors - they're ready to be taken to the Community House. Wedding favors - done. Jewelry & Make up - done. Ring bearer and flower girl pillow & basket - done. Mother of the Bride dress - done. Scrapbooks - almost done. Bruce gets here on Wednesday!! I'm SO very ready for my groom to with me. ... I should have been a wedding coordinator!! My mom was doing a wedding today and she asked me to come along as a wedding coordinator and I had a ton of fun. It was completely low stress for me since I didn't know the couple, so I just (among other things) moved everyone into the church, got the wedding started, pushed the little ones down the isle and opened the doors for the bride so she could make a grand entrance. How fun!! Bruce and I left early Thursday morning and drove up the coast to New Castle, DE. We were making great time until we encountered the stalled trap that is D.C. and Baltimore traffic. Ick. We got (okay, well since I was navigating maybe it was my fault) frazzled because of that and ended up in New Jersey (I thought we were supposed to cross the Delaware River!! ), had to turn around, got back into Delaware, got off the highway and promptly drove past our hotel. Oy. We finally got to our hotel and then went and had dinner with Sarah!! Of course, on our way to dinner, we drove past the restaurant and ended up in Pennsylvania. Double oy. Regardless, we made it and I hadn't seen Sarah since November 2007, so I was thrilled to see her and to know I'll see her next week!! Then next morning we got up and drove in the pouring rain to Cape May, NJ for Jason's graduation. I guess the rain kind of showed WHY it's so important to have strong men and women in the Coast Guard (if I were stuck on a boat in the middle of a hurricane, I would sing praises if I saw the Coast Guard pull up) but it was still wet, cold and windy outside. Not a great day for driving long distances or walking around a base (or looking cute - my hair was have a "Monica in Barbados" moment). The graduation was amazing!! I took a bunch of videos, but blogger isn't letting me upload them right now. As soon as I can get it to work, they'll all be posted!! 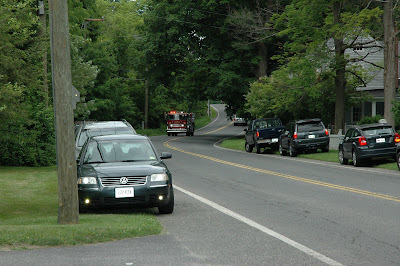 I drove through the rain and traffic up to CT that night while Bruce went home to Myerstown with his family. He'll drive up here with a couple of his groomsmen on Wednesday. It's probably good that we're spending a couple days apart, good that we have this time with our families, great that we got an extra two days up north, even better that we saw Jason graduate - we would have traded all of this for Jason to be at the wedding. But we're making the best out of a tough situation. When life hands you lemons, sometimes all you can do is put them in a glass of iced tea. In the meantime, I'm moving in a million different directions trying to work out last minute details, favors, music, bulletins, etc. etc. etc.. If I keep myself busy, I don't think about all that needs to be done, or the fact that in less than a week I will be married!! I'm taking it one day at a time, one hour at a time, one moment at a time, one prayer at a time. And I've never been more sure of anything in my entire life. For the most part, Bruce and I are packed and ready to go. The car is packed (and I mean PACKED) but everything seems to fit!! I drove over to Powder Springs to drop Lilly off with my friends Kristi and Angie. Wow. Getting there was slightly traumatic. Lilly cried. I cried. Lilly howled, I called my mom and bawled. I let Lilly out of her carrier and she crawled all over me and the steering wheel. She continued to cry. I prayed. It didn't really help her but it did help me. We finally got there and I have complete faith that she is in phenomenal hands and won't miss me at all. Now I need to finish packing the car, pack up my backpack and it's off to bed. We're going to try to get an early start. A few days ago I sent my friend Sarah and e-mail slightly freaking out about all that still needed to be done for the wedding. I babbled a couple of things that I could remember and hit send. About twenty minutes later she replied and attached a word document to her e-mail. She had separated out everything that I had said and created a to-do list for me - complete with columns indicating the tasks, the person who needs to complete each task, the day it needs to be completed by, extra notes and a blank column so I can check off when things are done. If anyone needs their lives organized, I would suggest hiring Sarah. Seriously - she's completely organized me. I gained perspective on priorities and started to check things off my list. Lists are my new best friend. In other news, we're slowly packing up. Friends and family thought it would be smart of me to start packing early - less mayhem later. Sounds good in theory, right? Well - I think it's just giving me more time to pack more stuff. I've so far filled up both a large and small duffel from Vera Bradley, as well as a garment bag (with roughly 15+ skirts/dresses/pants/jackets in it) and a small rolling suitcase for shoes. I haven't started on toiletries. Who thought it would be a good idea for me to start packing early? Bruce looks horrified. UPS dropped off another wedding gift today - a new microwave!! I bought our old one before I left for college and it's been through the wringer!! It was starting to make horrifying noises when I used it, so I am SO thankful for a new one. Plus - look how nice all of my black appliances look together!! All year I've been thinking that our wedding is forever and a few decades away and all of a sudden it is TWO WEEKS AWAY. No. Wait. LESS THAN two weeks away. I remember looking at our wedding website on The Knot and the countdown was still over 100 days away and now it's less than two weeks? Seriously - when did that happen?! Bruce checked the mailed on his way home today and there was a package slip in our mailbox - he came in to drop off his stuff and said he was going to walk up to the leasing office to pick up the box. I suggested him driving because it was really hot outside (it hit the mid-90s today - hello, Summer in Atlanta, I didn't really miss you). About ten minutes later my phone rang ... it was Bruce calling to ask me to "help" him. I didn't really understand why he needed my help with one package, but he assured me I would understand when I got down to the car. I did. This is me with all of the boxes that the leasing office was holding for us!! They all came today (Bruce had picked something up on Saturday so we know they had to have all come today). Apparently the leasing agent that he talked to greeted him with, "Oh good you're 1625!! We've been tripping over your packages all day!!" Bruce and I had a really quiet weekend. I laid by the pool, Bruce went fishing, I did a lot of laundry, Bruce did a lot of dishes. We cleaned. We went to Target and bought a new DVD player to replace ours because it wasn't reading discs and only opened half the time (I bought it when I went to college - and bought the cheapest one I could find - so I'm surprised it lasted as long as it did). We took care of some wedding stuff that hadn't been taken care of yet (though probably not as much as we should have). We called in take out. We slept in. It was really nice to just relax and be together. Because we're in for a busy couple of weeks!! I went to work today only to realize that my entire office was on a staff retreat. Whoops. I wasn't supposed to be there, but I guess I didn't need to be at work, either. Luckily I had a data reconciliation project that I was working on last week so I did that, had lunch with my wonderful friend Stacey and left when the internet portal I needed to be in for the project stopped working (I like to think God hacked into the internet as a way of telling me to go home early). Now I'm sitting in the living room watching Cake Boss on TLC. Has anyone watched this show? It's hysterical!! And I wouldn't call what they make cakes, I would go as far to say they're works of art. I really want to go to this bakery, I think it's in Queens. I'm relaxed for the moment and thinking that if there has ever been a time for me to exercise my spiritual discipline (i.e. "Give it to God and Get Over It"), it is now and for the next two weeks. I need to remember - amidst the stress, anxiety and craziness - to stop what I'm doing and say, "God. I CANNOT do this alone." I was out on the balcony talking to my mom on the phone this afternoon when Lilly cried for me to let her out with me. When I hung up, she was basking (and I mean BASKING) in the sunlight and I couldn't bear the thought of making her come in. So I took pictures and a video instead. Seriously, she's got the life. I would appreciate any and all prayers as Bruce and finish up the last leg of our wedding journey ... I know nothing stops or begins with the actual wedding day, but it will be nice to be able to think about something other than worship orders, beer types, flower arrangements and flatware! !